Some special effects and filters are fun or useful; only a few become absolute necessities. Nik Software Color Efex Pro ($100, 15-day free trial) is in that latter category because it is not only one of the finest collections of Photoshop-compatible plug-in filters available, its quality and versatility make it almost indispensible. Unlike ordinary filters that simply mask the original photograph with new color or heightened contrast, Color Efex Pro understands the underlying concepts behind photography, so that its effects manipulate the light, color, contrast and saturation with sophisticated style and technological excellence. With 3.0, the new interface is zoomable and more flexible. Similar in some respects to Nik's Silver Efex Pro, Color Efex Pro effects may be applied globally to a picture. Or, they can be applied selectively using Control Points or a Brush. You can place the resizable Control Points anywhere within the preview to set the effect's opacity on specific areas. In other words, in our screen capture, we could have set the Sunshine effect to be applied at 100% on the crane's head, 82% on its body, and 50% on the water. If we used a Brush, we could have carefully and precisely painted the effect onto our photograph, varying the brush size and opacity as we worked. The Standard Edition, which includes a sample of 15 filters, is available only as a download. The Select Edition ($160) has 35 filters, while the Complete Edition ($300) has 52 filters. While all the versions are compatible with Photoshop plug-in capable programs and Apple Aperture, only the Complete Edition is compatible, also, with Adobe Photoshop Lightroom 2.3 and Nikon Capture NX2. 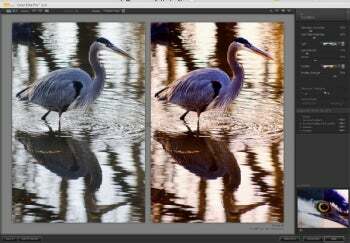 Color Efex Pro is a professional photographer's tool that novices will quickly learn to love.